If you are looking for that "magical cure" to control fire ants, look no further. Award Fire Ant IGR contains the Insect Growth Regulator fenoxycarb to kill fire ants and bigheaded ants in lawns, pastures, sod farms, golf courses and nurseries. Award Fire Ant Sterilizes the fire ant queens and stops egg production. An industry standard. The recommended 2 applications per year will give close to 100% control. Comes in 3 or 25 lb bags. 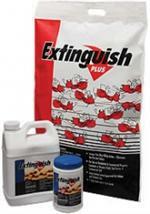 Uses fenoxycarb adding this to our list of green pest control products! Would you like to see the Award Fire Ant IGR MSDS sheet? How about the Award Fire Ant Label?